Back injuries can be extremely painful and long-lasting. According to the Federal Bureau of Labor Statistics, the back injuries of more than 1 million workers account for nearly 20 percent of all injuries and illnesses in the workplace. Your Safe Lifting Zone is between your hips and shoulders. Lifting and carrying objects in this area is considered proper body mechanics and provides the best chance for minimizing injury. Lift weight using your arm and leg muscles. Size up the load. Test the weight before you try to lift. If it's too heavy, divide it up, get help from a co-worker, or use a machine, dolly, or cart to assist you. Survey your route. Look for hazards such as spills, uneven surfaces, corners, and flooring changes. Make sure your mind is on the job, your spine is in its neutral "S" curve posture, and you are in your Safe Lifting Zone. Get as close to the load as you can. With feet shoulder-width apart, either squat down with both feet equally squared or put one foot in front of the other using a diagonal squat. When performing the diagonal squat, bend at the hip not with your back, to lean over your forward leg. Keep your spine in its natural "S" curve and let your legs do the lifting. Lower down to one knee. Hold the load close to your body as you squat. Balance the load on your other knee. Pause to adjust your grip, and set down. If you have to turn, aim one foot toward your destination. Use your feet to pivot, don't twist with your back. Set the load down in one slow movement. 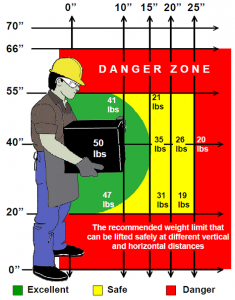 Carrying heavy loads in your Safe Lifting Zone. 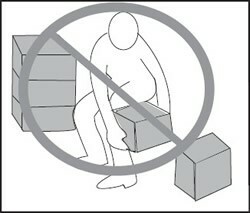 Store heavy items at waist level. If the load is heavy or bulky, use a cart or dolly instead of carrying. Visit the University Safety and Risk Management website for more information about reporting hazards on campus. Thank you, for helping us keep our campus safe!